Reserved parking: where will it end? So, we started with reserved parking spots for handicapped people, and who could argue with that, without seeming petty and mean? And who would be so cruel and callous as to pick on expectant mothers? Then it was expanded to parents of small children. I’m just wondering, what’s next? Parking for deaf people, who need to be closer because they can’t hear traffic (as I’m sure the argument will run)? Sexually-segregated parking for Muslims’ sensitivities? Where do we draw the line, as a society? How many parking spaces will we let either governments and/or businesses choose to set aside, inconveniencing the rest of us? And why should all manner of people who previously had to make do with parking spaces as far away as the rest of us, suddenly get to have spots up close? Why? Like social stigmas against single motherhood, and previously a lack of government support for those in such a state, sometimes the best thing for society is to accept some level of unfairness, because in striving to eliminate certain injustices, one may easily inadvertently end up causing others. I don’t know about Canada, but down here in the states, or at least in my state, those parking stalls for pregnant women or people with small children are a courtesy offered by the businesses, not a legal mandate punishable by a fine (in the same manner as parking in a handicapped stall would). I get your point, though. Courtesy today, law tomorrow…it all stems from a complete lack of trust we have in each other to just be decent human beings, and an unwillingness to let it go when we come up against someone being a jackass. Courtesy stalls for pregnant women are not the beginning but a natural outgrowth of the desire to control every aspect of human behavior and cleanse it of anything that gives Mindhurts and Feelbads to feminoliberalists. – special parking for teenagers, Asians, and women from Islamic countries, with extra wide stalls so they can’t hit other cars. We all know they don’t know how to drive, anyway! The New Segregation, improved for your enjoyment, and of course done better this time because the Right People are in charge. And of course I hope you’ll recognize the tone of sarcasm I intend in my above list. Hey Cranberry, good to see you here again. Yes, it’s mostly private businesses with those ‘expectant mothers’ / ‘with small children’ types of signs, and indeed no fine if one contravenes, hence why I qualified ‘either governments and/or businesses’. You’re funny. 🙂 But serious, too. 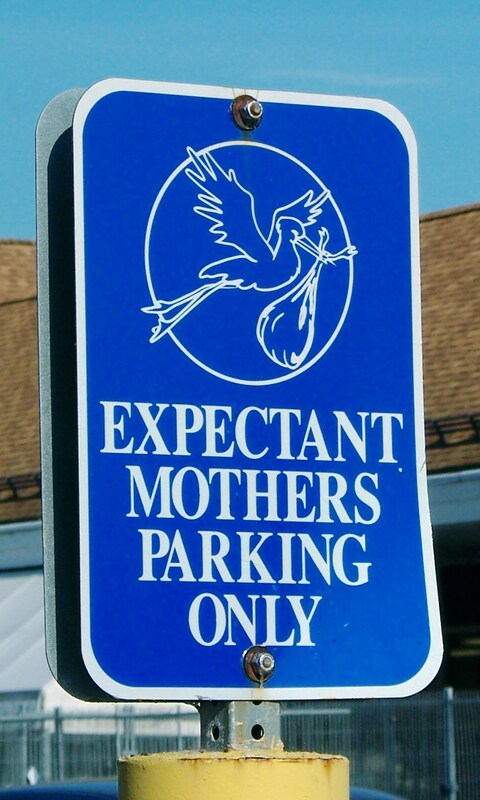 Years ago, a grocery store near me put up one of those signs reserving special parking spaces for expectant mothers. As someone who experienced a debilitating amount of illness, weakness, and physical exhaustion during all of my pregnancies, I thought having a parking spot near the entrance for expectant mothers was a very good idea, and I wrote a nice letter to the store manager commending him for it. But he must have gotten a lot more complaints about it than thank-you notes, because the sign soon disappeared, never to return. I understand the whole slippery slope concept. And I think any legal requirements regarding special parking privileges for anyone are not just wrong, but unnecessary. If having preferred parking spots for people with disabilities that make it hard for them to get around — those who use wheelchairs or walkers, for instance, as well as those who are in the advanced stages of pregnancy — is good business practice, then businesses will do it voluntarily, without any need for statutes or ordinances requiring them to do it. If I were a business owner, I would limit such special treatment to people with conditions that inhibit their mobility. Anything else is just silly. Some shopping centers now have special spaces for veterans, and although I defer to no one in my respect and admiration for veterans, I think that’s foolish and kind of insulting; able-bodied veterans can walk from their vehicle to the entrance of the building regardless of where they are parked, and if they are disabled, they qualify for the regular handicapped spots. I’ve also seen reserved spots for senior citizens, which is also a little silly — there’s nothing about being old that in itself should qualify one for a better parking space. Lots of older people are healthier and more energetic than many younger ones. Haven’t a lot of old people managed to achieve their advanced age precisely because they were always careful to get plenty of exercise? Exactly! This is the sort of mission creep that unfortunately, even some in the private sector think is a good idea. But like you say, why can’t the handicapped spaces, mandated by law, be sufficient, as if a senior or veteran is handicapped, he’ll be eligible indeed to use them? What, more spaces need to be set aside? The problem has to do with the sheer number of people who need to park. There are enough inconsiderate people that without designated parking spots, all of the close in parking will be taken. by people who simply don’t think about it, or don’t care. This is an area in which local government is entitled to set up some rules. My guess, however, is that the rules relating to disabled people parking spaces are set, not by local government, but by some state or federal formula contemplating hordes of the handicapped descending on the parking, with the result that there are always several empty spots for handicapped parking. We can’t rely on private businesses to establish the handicapped spots, because they don’t. I’m sure there are logical reasons for this, but as Chesterton observed, logic can be a form of madness. As far as I’m concerned, expectant mothers, at least by the middle of the second trimester, are handicapped. Particularly when the weather is extreme. Well, private businesses HAVE established the expectant mothers and mothers of small children parking, so I see no reason why they wouldn’t today, if the laws stopped mandating handicapped spaces, still continue to do so, as long as customers agreed. I suppose if enough customers complained, they might remove them. Let me play devil’s advocate here, for a minute: why not? If we are aiming for a truly egalitarian society, why set aside ANY spots for ANYONE? Unlike ramps for wheelchairs, elevators in buildings, etc., disabled spaces don’t actually create new access where there hadn’t been any before; they are merely a kindness, a mercy. Since that be so, what makes someone on crutches or in a wheelchair automatically so deserving of such a kindness or mercy? I’d prefer a society that ensures access to modern buildings, with wheelchair ramps and elevators, but doesn’t make the path that people have to hobble on crutches, creep with walkers, or wheel across in wheelchairs, automatically shorter. That strikes me as a fair compromise – removing actual impediments to access, while not patronizingly declaring handicapped helpless, and in need of special parking spaces real close to buildings. The rest of us have to get our exercise and walk from as far away as the closest spots are; why not them, too? Wouldn’t that be truly egalitarian, having no special privileges? Progressives are always about special privileges, with things like affirmative action and the like. I’m brown but I don’t believe in such things. Nor do I see the necessity of setting aside any parking spaces for any one. Hows about the farthest away parking spot are flagged as the only ones to be used by the obese? Say why did you start using your real name? How is the courtship going? Are getting married?